WELCOME TO Future Learning Lab’s 8th annual international summit on the future of education, learning and technology in an age of digitalisation and globalisation. A “leap-year event” between our Oslo Roundtable in June 2018 and our more ambitious 2019 Summit, the Kristiansand Summit in September is built around our core constituency with some well-known speakers and some new ones. 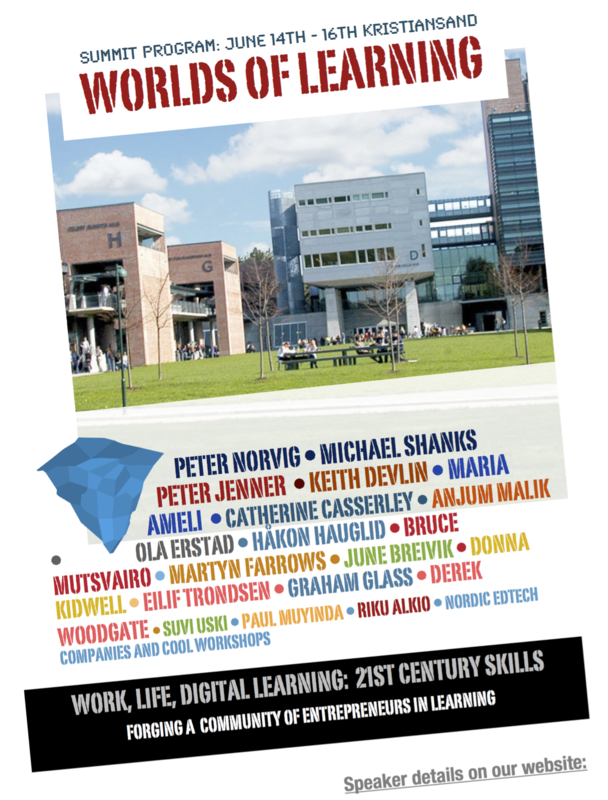 Future Learning Lab is a research center at the University of Agder and an international, collaborative network. Following up on the June 13th Oslo Roundtable, our summit focus this year is on life-long learning, from the perspective of how a changing work-life and changing media use in our leisure time challenge education institutions and education policy-makers to engage in shaping future learning along a new trajectory: We know more than ever, process more information than ever, travel more, engage more and make use of more information and communication technology than ever. Sooner or later our education models will also meet the full challenge of artificial intelligence and what may entail. Our student mass is changing, as are their media habits. A more flexible work-life demands more adaptive models of education. Our summits provide insightful keynotes by world-known thought leaders, as well as engaging working groups for research paper presentation and general audience themes and issues. Kristin Ingólfsdottir was president of the University of Iceland for a decade, advocating digital transformation. Phil Komarny is Vice President of Innovation at Salesforce, with a long background in exploring and developing Education Technology. Michael Shanks is a returning speaker, with a long-standing commitment to exploring roles and aspects of digital media in the humanities. Paco Nathan is a world-leading AI and Gaming specialist. Rosan Bosch is an inventive Dutch designer who specialises in the design of new learning spaces, from her studio in Copenhagen. Our format for 2018 is small — with a focus on engaged participants who seek an Open Innovation and Collaboration community. We offer meriting publication possibilities for those interested and a small enough venue for you to make new contacts and network efficiently. In both 2016 and 2017 we had about 25 countries represented. Check out our website for more details. Ticket prices includes ticket fee and 25% VAT. Mostly interested in entrepreneurship, EdTech, AI and other media innovations? Join us for Day 1 on WLS 2018. 15% discount for bulk sales 5 or more tickets. Mostly interested in the transformation of education and learning institutions? Join us for Day 2 of WLS 2018, 15% discount for bulk sales 5 or more tickets. Interested in the bigger picture of innovating the workplace, education institutions and life/long learning? Hang out with us – publish, plan, connect. World Learning Summits mix high-level international keynotes with a friendly atmosphere, academic papers and entrepreneurial best practice. Our last three summits have included close to 100 panel speakers from more a dozen countries. Each year, some of them return And each year, we add more. In 2018 we are moving the summit to the autumn months, but generally there is still the option to enjoy the weather, ocean sights and leisure that South Norway offers. Besides leisure and presentations, come to World Learning Summit to make new friends and join in on discussions that aim to forge a growing community. Sign up for our newsletter and join in on planning future events. Rapid media developments now change basic conditions for education and learning. The challenge is on to define and refine a cross-disciplinary dialog. Join us, to reflect on how education as a social institution is called on to adapt. Once a Nazi HQ during WW2, the building and its learning center has become a nationally leading venue for situated learning, bringing more than 6500 students here each year to reflect on contemporary peace education and conflict resolution. The Arkivet Foundation holds a deeply disturbing exhibition of wartime cruelty, tempered with a story of human rights orientation and a futures focus on how to engage young students in critical thinking and reflection. Whether we work in old or new media, and whether we address school or work, learning is about story and motivation. Why not frame WLS 18 that way? Students learn that local stories and events have global relevance. They learn by exposure to “raw facts” and “real life”, they way we do outside of school. What happened “here” happens “everywhere” in our turbulent world. Being aware and being critical is a good investment for – life long learning in practice. In our talks we will attempt to bridge challenges facing education with challenges facing work-life in a fast-changing world, from that vantage point of narrative and story: Learning begins with story. Engagement begins with story. Stories in real life and stories in media meet, mix and transform. Bringing the future of work and the role of education/learning into focus, one way of looking at innovation is to understand the social and cultural contexts in which it happens. Arkivet is entrepreneurship, work, learning and innovation rolled into one. Donna is a veteran explorer of all things new in the are of education, learning and technology, based in Austin, Texas. She is a co-editor of the 2018 Summit proceedings. Eilif is one of the "Nordics" in Silicon Valley who keeps inviting and sharing his perspectives, part of our team for the seventh time. He is a chief architectof our workshops framework. Aleksandra is a university lecturer at the UiA department of pedagogy, and a contributing member of our Future Learning Lab. Vidar is in charge of events planning, and CEO of Substans Analyse ... the company running our websites and marketing. Åke has a long history from eLearning and pedagogics, collaborating on the Future Learning Lab since the start. Velkommen til Oslo Roundtable 13.6! Join our list of interested attendees to get the latest update about our upcoming WLS 2018. Just send us an email address with your full name and occupation to join. I keep coming back to these conferences. May there be many more. I am impressed by how the organizers stitch together the programs – meaningful, every time. The people behind these conference think like a start-up. It´s my impression that academics usually don´t. The Future Learning Lab has an impressive, international approach to what they do.